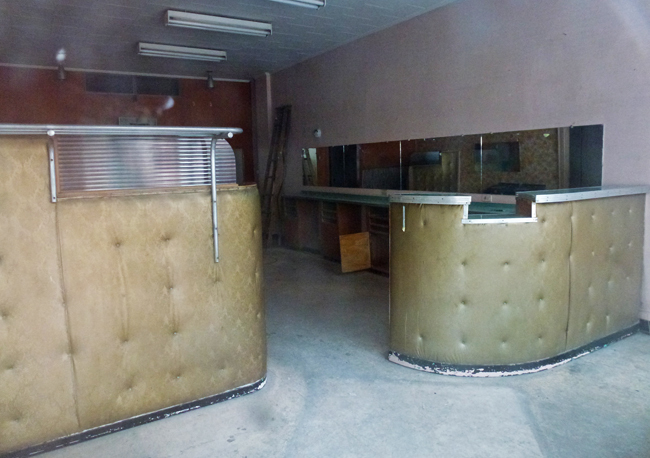 This is the interior of a beauty salon that has been untouched for years and years as its owner retired and simply closed the door and continued to live upstairs until passing away during the winter in her mid 90s. The building has been put up for sale and the long closed blinds have been opened to reveal this flashback to the 60s. It will be interesting to see what will move in here next. I love the mural, but this is intriguing. I guess the mortgage was paid and it was easier not to move. That is just plain fascinating. A step back in time. I wonder if the equipment used by the workers is still there. I think this place should be made into a 1950s deli. While I always view, I don't comment. This time, what an amazing capture of time. Hello, it will be interesting to see what kind of business moves in and take over. Have a happy day! Wow, flashback is right! That is so 60's/70's. You will have to keep us posted on the changes that are coming. The retro look ready to go! I was thinking it was a beauty salon! Very cool to find something untouched for so long! I hope they do something with this, it would be a shame to throw it out. Good place as decor for some series from that time. Certainly vintage style! It does look a bit sad. I understand that "mid-century modern" is a hot decorating style at present, but I don't get it.